Check out Matt and Pom's wedding based at The Fable here - they styled it up so nicely! The Hat and Tun is a traditional English pub in the heart of Farringdon, available exclusively for private events on weekends until 1am. If you are great lovers of a proper english pie, this place is for you! Perched besides Putney bridge, the Star and Garter offers fantastic views across the river Thames from it's dramatic art-deco ballroom on the first floor. One of Putney's best kept secrets! 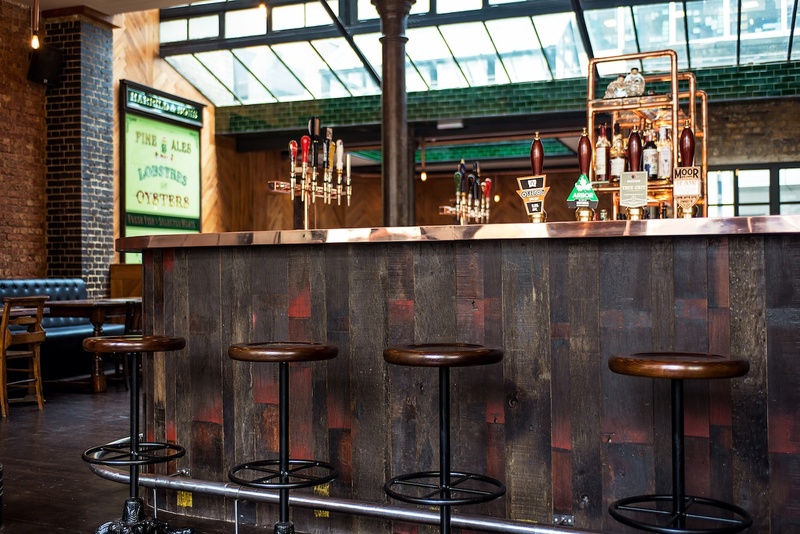 Nestled in the heart of Bishopsgate, The Drift is a modern take on a London pub, spanning two floors of striking interiors and beautiful decor. A wonderful choice for an alternative city wedding. A beautiful modern dining room housed within a former traditional brewery, Chiswell Street Dining Rooms is a wonderfully chic location for a city wedding. A beautiful neighbourhood dining room in the heart of Chelsea, The Henry Root offers a versatile, relaxed space for intimate weddings of up to 70 guests. Large, stunning and stylish Harrild and Sons is wonderful wedding reception venue housed across 2 floors with 2 beautiful bars located in the heart of the city, with late license until 4am! The White Swan is spread across three floors; the ground floor pub, mezzanine level and first floor dining room. It's the perfect space for a relaxed, city wedding. A charming little pub tucked away just off Fleet Street offering superb food and amazing beer. Hack and Hop specialise in relaxed, informal dining such a sharing platters and banqueting style dishes, perfect for chilled out pub weddings. Sat in a peaceful location in Regents Place, tucked away from the hustle and bustle of Euston Road, The Refinery is a cool alternative to a traditional pub wedding. Besides the Holburn Viaduct, The Fable is a chic modern bar created around a literary theme. We especially love the cosy book corner, perfect for a newlywed smooch. Check out Matt and Pom's wedding based at The Fable here - they styled it up so nicely! Looking for your perfect London wedding venue? Search by location, price and availabilty here.